January 13, 2009 – New Features in Google Maps Ads Google adds a new “info window” for Google Maps and extra analytics. Google is actually pulling some of the more common tasks users do for businesses (ex: getting directions) into the window. . This is significant, because each of these “micro-conversions” represents an action that approximates ROI for your local business. Analyzing and optimizing around these activities and others will help improve your ad spend. . It’s also interesting to note that Google is pulling more of the site experience to their site vs. yours, a trend we also see in the comparison ads (detailed below). . .
February 20, 2009 – Updated Display URL Policy Disallowed multiple display URL domains within a single ad group. All text ads must now have the same top level domain. . For example, www.clickequations.com/blog, www.clickequations.com and www.example.clickequations.com would all be acceptable in the same ad group. However, you could mix www.clickequations.com and www.clickequations.paidsearch.com in the same ad group, for example. . The display URL affects your CTR, conversion rate and is a factor in your Quality Score, so it’s important to monitor changes to their policies. .
March 4, 2009 – Expandable Rich Media Ads on the Content Network (beta) Expandable rich media, which offer interactivity and video streaming, was opened to beta advertisers on the content network. . Rich media has to be measured differently than traditional display ads, which is limited to impressions, clicks and post-click activity (though viewthroughs are now available, see below). Rich media, meanwhile, can be expanded and interacted with in a variety of ways: video plays, form completion, etc. . This also introduce an element of complexity in the analysis of your traditional display campaigns. How often are you competing against rich media ads? How does that affect your performance? . These questions aren’t easily answered today, but will become more important as the number of advertisers and media formats increases on the Content Network (see DoubleClick announcement below).. .
March 11, 2009 – Interest Based User Targeting on the Content Network (beta) New behavioral and interest-based targeting on the content network. Content network targeting has been keyword based or placement targeted (you select from a list of sites). . Google is now classifying people into groups based on their visits to sites running AdSense, ex: Shopping – Coupons and Rebates. You can now target these groups without specifying keywords or choosing particular placements. . Display advertising is one of Google’s key focuses in 2010, so it’s likely that we can expect more targeting options going forward. .
March 12, 2009 – Hal Varian’s AdWords Auction Video Google’s Chief Economist explains the AdWords auction. In this video, Hal Varian shared a lot of detail that helped illuminate some important concepts: clickthrough rate is the number one factor in Quality Score, your bid actually plays an indirect role in the final calculation of your CPC, and increasing your Quality Score could save you 20% or more. .
May 14, 2009 – Google Loosens Their Trademark Restrictions You can use trademark terms in your ad text in the U.S. even if you don’t own the trademark. Previously, Google permitted you to bid on trademark terms, but not use them in your text ad. Now, “you can use trademark terms in your ad text in the U.S. even if you don’t own that trademark or have explicit approval from the trademark owner to use it.” . You can expect increased competition among branded and trademarked terms from retailers, resellers and affiliates. Tools like The Search Monitor can help you monitor trademark use. .
June 17, 2009 – Import Google Analytics Goals into AdWords Advertisers who use Google Analytics can now import conversion goals into AdWords (click to enlarge). If you’ve tagged your site with Google Analytics, you can substitute that measurement for the Engine specific conversion tags to measure conversions and revenue. . To use this feature, advertisers must opt-in to share their data with Google products or Google products and their benchmarking services. Keep in mind that both Google AdWords and Google Analytics currently default to last click revenue attribution. 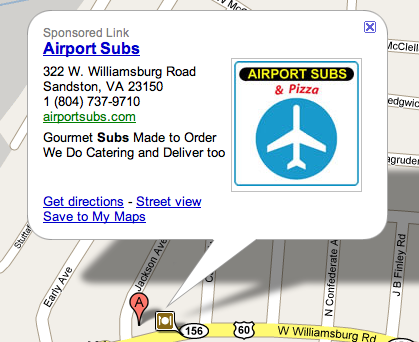 July 24, 2009 – Local Extensions for Local Business Ads Displays address alongside the text ad for relevant searches. Local businesses can now link their Local Business Center account to AdWords. . Your location will now appear alongside your text ads in one of two ways. Either you can associate specific location extensions with individual ads or let Google dynamically match eligible locations to a user’s location (usual determined by IP) or geographic modifiers in their query (ex: philadelphia gym). . These extension replace the local business ads format, but differ in two important ways: – Business title: You will no longer be required to have your business title be the first line of your ad text. – Targeting restrictions: By default, enabling ad extensions at the campaign level will not limit your ad targeting. Unfortunately, Google hasn’t released any reporting to help you understand when local extensions appear and how they affect your performance. Make sure to test your text ads and set your geo-targeting options properly as you transition over. July 30, 2009 – New AdWords Interface Google redesigned the user interface and features in their web-based editor for AdWords. Reaction was mixed, according to some polls. .. Most notable was the addition of the Opportunities tab, which pulls together a number of tools and automatically suggests changes or additions to advertisers accounts. Devin Sandoz said that this is a key area for 2010, which means we can expect to see more features.Right now, the tab primarily presents suggestions for keyword additions. . The relevance of these words varies wildly, so be careful with your additions and make sure to mine your search queries. 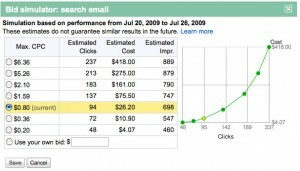 August 3, 2009 – Bid Simulator Launch Google new tool to estimate impressions, clicks and costs at different bids (click to enlarge). The data, calculated on a rolling 7 day basis and only for higher volume keywords, is an unusual move by Google to increase transparency into the bidding process. . You can see the potential (though theoretical) trade offs between impressions, clicks, CPC and total cost at various Max CPCs. As Hal Varian explains in another great video, you have to look at the incremental cost and profit per click, not just the potential traffic change. . This, combined with Google’s research showing that conversion rate doesn’t vary by position, can help you make more informed bidding decisions. Of course, you still need to optimize your Quality Score. For more detailed analysis, check out our article on Search Engine Land. August 6, 2009 – Google Moves Paid Ads Closer to Organic Listings Ads on the right side of the search results are now closer to organic listings. Previously, ads were set to a fluid width. As a user’s browser screen stretched, the ads moved further away from the organic listings, staying close to the scroll bar. Now, the ads stay fixed to the right side of the organic search results regardless of browser window size. While there aren’t any hard statistics, it’s likely that paid search clickthroughs increased at the expense of organic results. September 17, 2009 – The DoubleClick Ad Exchange is Integrated on the Content Network DoubleClick Ad Exchange sites are now part of the Content Network. Google has been aggressively pursuing the display ad market, first with its acquisition of DoubleClick and then with the introduction of the DoubleClick Ad Exchange. . Now, that exchange is connected to the Google Content Network (sites which run AdSense). This vastly increases the inventory of sites that your content network targeted ads could show up on. Make sure you run you run regular placement reports to see how these new sites could affect your performance and exclude sites where appropriate. . To learn more about the content network, download David Szetela’s book, Customers Now.. .
September 30, 2009 – Viewthrough Conversion on the Content Network New reporting about “where your ad is seen, but not immediately clicked on”. As part of Google’s expansion into display, they’re ramping up measurement and analytics. Viewthrough reporting attempts to show the value of an impression to conversions. . There are two key limitations: first, there is no proof that a user looked at your ad. Second, it requires that you have AdWords conversion tagging. Proceed with caution… . October 2, 2009 – Google Increases Advertiser Bans Google permanently bans advertisers “who’ve submitted multiple sites that violate our landing page quality guidelines”. A number of advertisers were excluded from AdWords in a short period of time, according to reporting by Barry Schwartz on Search Engine Land. . Some have speculated that these changes were related to Google’s introduction of product ads through product extensions (see below) and specific types of websites and landing pages. There’s no official word from Google on their blog. . This post provides a good process for appealing landing page Quality Scores. .
October 29, 2009 – New AdWords Comparison Ads AdWords Comparison Ads launch for mortgage queries (click to enlarge). Google has offered search suggestions and other forms of query refinement options for a long time. Now, they’re extended that concept into a structured experience starting in the mortgage/refinancing industry. . The new tool features a number of options to drill down: location, home price and income to name a few. The ads only show up in a limited number of areas and advertiser participation is currently by invitation only. They haven’t shared any details of how this will develop next or what kind of reporting will be offered. If you advertise in one of these industries, I suggest you contact your sales rep for more details. . Like the changes on the local business ads, Google is pulling more of the site experience to the SERPs themselves. If your business relies heavily on these kinds of tools (Progressive, I’m looking at you), you’ll want to keep an eye on how these ad formats change. You may have to differentiate less on tools and more on content..
November 3, 2009 – Ad Sitelinks in AdWords Some searches will produce ads that display up to 4 additional display URLs can be shown for “for ads that meet certain quality criteria” (click to enlarge). These are similar to the sitelinks you see in organic search listings, but you can explicitly choose which landing pages and text are eligible to be displayed (up to 10). . To setup ad extensions, click on the Campaign Settings tab and go to the “Show additional links to my site” section under “Ad extensions”. . The conditions that trigger these new ads are still somewhat unclear. A few things seem to be true: it’s for ads in the preferred position (above the free results) and those with a substantially better clickthrough than other ads. This is likely to be primarily brand terms. . Like many of the other changes to AdWords, reporting features to analyze these new options aren’t yet available. I’ve heard anecdotal evidence from my conversations at SES Chicago that the links improve conversion rate. Of course, you’ll want to be mindful of how these links push down organic results and potentially cannibalize that channel. November 11th and 24, 2009 – Product Extensions Open to All Product images, titles and prices from Google Merchant Center appear alongside traditional text ads (click to enlarge). This feature links Google Merchant Center (previously Google Base) to AdWords as an ad extension, similar to site links. . This is in addition to the Product Listing Ads announced earlier. Product extensions are charged on a CPC basis, while product listing ads are charged on a CPA basis. Product extensions are open to everyone, but product listing are currently in closed beta. . This is, perhaps, the most aggressive step Google has taken in their New Ads Formats Initiative (see The Future of AdWords below). According to Google’s own blog post, some companies have seen a 10% CTR increase with product extensions. . This has two practical implications. First, those extra clicks can only come from 3 places: organic listings, competitor ads, or users who wouldn’t have clicked on any ad at all. In the case of the first two, you could lose (or win) clicks, depending on where you show up on the SERP vs. yoru competitors. Given what a strong component clickthrough rate plays in Quality Score and ultimately your CPC, you want to keep an eye on it. . Second, (and this is speculation) it’s possible that the people who click on an image ad may convert better for your business than those who click on a text ad. If they can see exactly what they want before they get to your site, they may be better qualified. . The bottom line is that this is Google’s game, these ads aren’t going away anytime soon and you’ll need to run experiments to see how it works for you. Here’s an alternate version of the events listed in an interactive timeline: [iframe 460 460] . The Future of AdWords Late in November, Google announced their “AdWords New Ad Formats Initiative” and declared “This initiative is Google’s next chapter in search advertising and over the next year it’ll be a major focus for AdWords”. At SES Chicago, I asked Devin Sandoz, Product Marketing Manager for AdWords, about the guiding principles behind the initiative. He pointed to the evolution of organic search results, which have increasingly blended text ads with videos, images and news content. While those changes occurred, PPC ads have largely remained text only. It’s possible that ads may not get clicked on as often.And now, they’re experimenting with videos, product extensions & location specific information to counteract the effect. For advertisers, this means you can take your existing campaign and Google will attach relevant information “when it makes sense.” I think this is an important analogy which tips Google’s hand a bit about where AdWords is going. The evolution of the organic listings with universal search producing blended listings is likely to slowly make its way into the paid ads. Could personalized text ads be far behind? We already have session based retargeting with Broad Match (here and here). It now means your performance has much more to do with the context of the SERP than ever before. Were you competing against product ads? Which sitelink did someone click? Are you fighting against a more robust comparison ad? 2010 is going to be a tougher year for AdWords advertisers. How are you planning to keep up?